When I spotted BLINC announcing on Twitter that they were releasing their first eyeshadow palette I was super excited and couldn't wait to see the shades within. 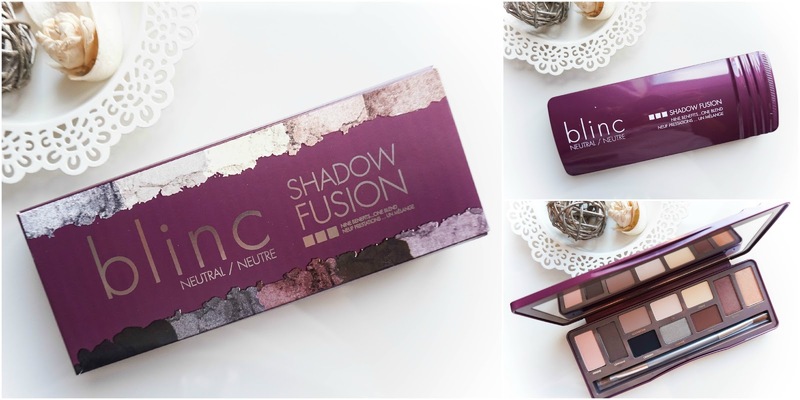 So when the brand offered me the Shadow Fusion* palette for a review I couldn't say yes fast enough, not that I need any more eyeshadow palettes, but like I have mentioned before I have an addiction for sure. This palette took a while to get to me seeing as it was a brand new release and even though I received it over 2 weeks ago, I wanted to make sure I really got to grips with it before reviewing it. The palette has the same "life proof" formula to it as the rest of Blinc products, since it claims to combine "the best attributes of liquid, powder & cream shadows" all in one. The palette is quite bulky and it's something I wasn't expecting as it wasn't clear from the photos online, this obviously makes it that bit more difficult to bring away with you (just something worth noting). I do like that it shuts securely and that it includes a large sized mirror along with a really great quality Blend Duo brush, which is always much appreciated in a palette. There's a wide variety of shades to create any kind of makeup looks, wether you're looking for something more subtle or a full on smokey eye. My personal favourites are Cinnabar, Moonstone, Terra, Sienna & Amber which are just gorgeous shades that I can easily wear on an everyday basis. 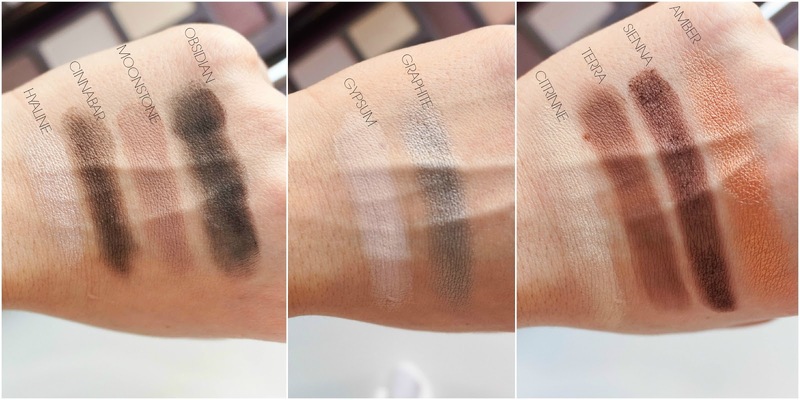 The pigment in all eyeshadows is brilliant as one swipe alone was needed for each of the swatches, not to mention that they all feel very soft & buttery to touch. My only niggle with this palette is that a few of the shades are quite chalky & they don't blend as easily as I would like them to. For example Obsidian is the worst of the bunch and you can see that from the swatch below. The only way I can see myself wearing the shade is applied as an eyeliner using MAC Fix +. This doesn't particularly bother me as there never seems to be a palette where one or two shades aren't completely up to scratch. But for the price tag of £39 it's definitely something worth mentioning so you can take it into consideration. Another positive though is that the eyeshadows last really well even without a primer, which is always a plus. It took about 8 hours of wear time before I started seeing signs of fading and slight creasing, so that's amazing. 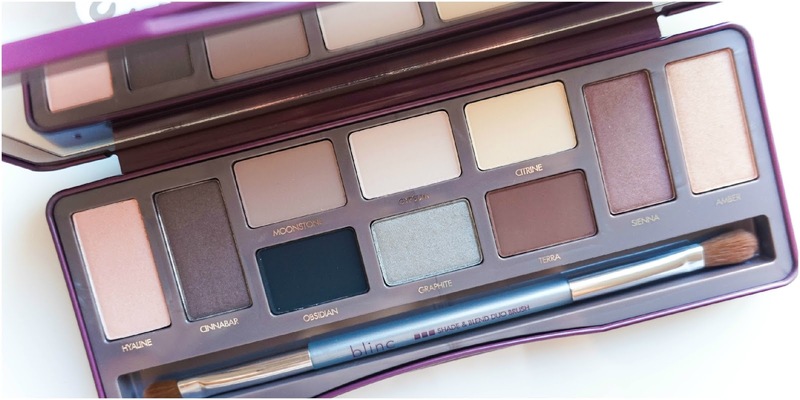 Overall this palette has some great elements to it and some stunning shades, but there's also a few negatives worth thinking about such as the bulkiness of it and the chalkiness of certain shades. I'm happy with the shades that I mentioned above, the longevity and I love having it in my collection. Blinc also sent me one of their Eyeshadow Primers to review so do pop back tomorrow for a post on that, to see how it compares to my much loved Urban Decay version. Till then I'd love to hear your thoughts on this palette? What do you think of the shades within? *This product was kindly sent to me for a review. All opinions are my own and will remain that way throughout the whole review.